1,000 Acres of Tropical Paradise - The perfect setting for your wedding. Have a traditional ceremony at the picturesque Prospect Chapel, shown below, located in the midst of a tropical plantation. Throw a fully catered reception with live music, candle-lit dining and dancing until dawn. 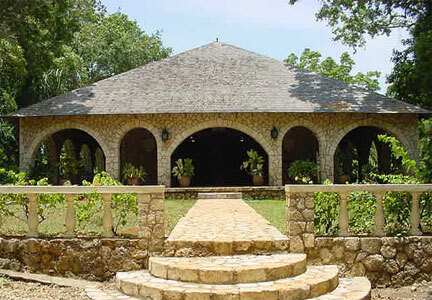 Wedding ceremonies can be held at the Prospect Chapel, in the Great House gardens or at any of the five villas overlooking the Caribbean Sea. Prospect Plantation’s non-denominational chapel was built in 1970 by Sir Harold Mitchell. 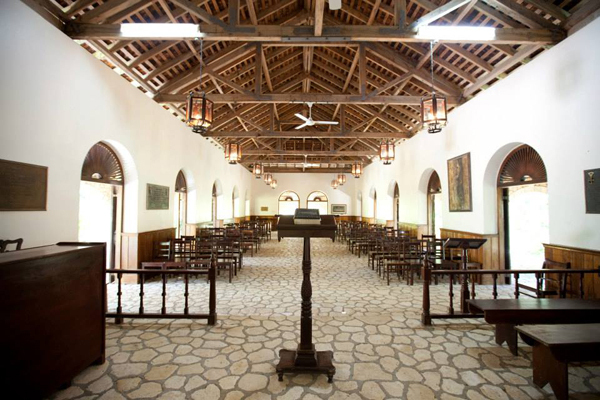 The chapel is decorated in a simple style and is constructed entirely of stone and hardwood harvested from the plantation. The Prospect Chapel has capacity for one hundred and twenty guests seated inside and an additional eighty guests in the wings. Couples are encouraged to plan their wedding in any way that they choose as long as their plans are in keeping with maximum guest list capacities.